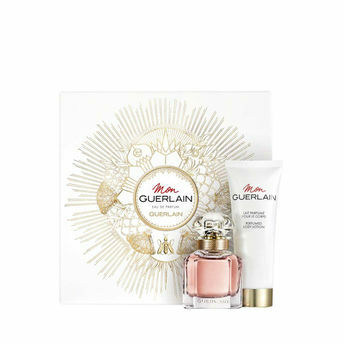 To celebrate Christmas, Guerlain has given carte blanche to the Parisian artists and wall tattooers, Alex and Marine, to create exceptional cases. Their work puts a modern spin on the house's iconic codes in a flash of gold. Mon Guerlain, the House's new fragrance, is a tribute to today's femininity - a strong, free and sensual femininity, inspired by Angelina Jolie. The fresh oriental fragrance enhances exceptional raw materials: Carla Lavender from Provence, Sambac Jasmine from India, Album sandalwood from Australia and vanilla tahitensis from Papua New Guinea. It expresses the quintessence of a history replete with experiences, nourished by success, expertise and generosity, all infused with the same passion since 1828.